The brewing process was probably discovered accidentally, air borne yeast cells having the ability to ferment cereals soaked in water . Eventually it was discovered that if material from the top of one fermenting vessel was transferred to another, a new brew could be initiated thus the production of beer could be continuous. These processes were uncontrolled and many of the processes involved in making good beer were of a craft nature and at a scientific level only poorly understood. The beer produced by a master brewer is certainly interesting, but variations from brew to brew are inevitable and yields could vary widely. As a result these traditional methods are going out of favour. Local and global beer producers are in intense competition. In some cases the aim is to produce vast quantities of highly reproducible and comparable beer at many production sites. The argument is that beer X must be indistinguishable if it is bought in Toronto or Sydney. In other situations the strategy is totally different. The increasing popularity of ‘traditional’ or ‘local’ beers requires that brewers produce a range of products in small quantities but drinkers require that the beer does not vary from barrel to barrel or bottle to bottle. To control the process of beer making on-line analysis/monitoring/control would be an obvious solution, but the variability and complexity of the process means that this approach is not yet in widespread use. The combination of skill by the brewer and analysis at the finishing stage is much more attractive to the industry. The increasing level of control by regulators and the importance of product liability are also driving these changes. Beer analysis traditionally involves methods such as catalytic oxidation, fractional distillation and gas chromatography, all of which requires experienced and highly skilled laboratory staff. Further, the analysis of the product tends to be slow so that it is hard to respond to out-of-limits data. Alternative instrumental methods have therefore found a place in which simple dispersive near infrared and the less sophisticated filter based nir systems have been introduced. But often these systems are dogged by systematic errors, and required operation by relatively skilled and experienced technical staff. Perkin Elmer, who have been producing spectroscopic solutions to analytical problems for over 60 years perceived that what was required in the Brewing Industry was an instrument based total analytical solution, easy to use, fast and sufficiently rugged that it could reliably be used close to the production facility and by relatively unskilled staff. This article describes the Brewers Assistant; a near infrared based total analytical solution to the problem of beer analysis at the finishing (pre-packing) stage. 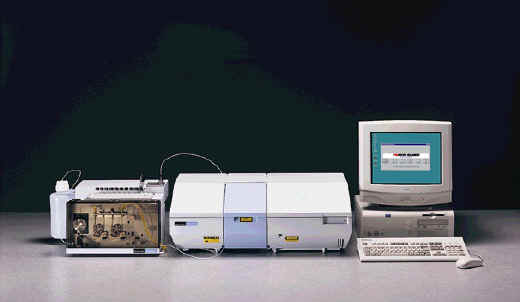 The instrument part of the system consists of an F-T near infrared spectrometer; a monitor and an auto-sampler, all controlled by the software, see Figure 1. The beers (only about 5mls of each specimen) are filtered into simple vials made of glass and these are loaded into the auto-sampler. The vials are selected one by one and the beer is pumped into a quartz NIR cell with a path length of 0.5mm. A sample shuttle inserts the cell into the beam where the spectrum of the beer is monitored in transmission. The cell is then removed automatically, emptied and flushed with water to clean it before filling from the next vial in the auto-sampler. While the cell is being cleaned and filled the instrument runs a background spectrum. The system is illustrated in Figure 2. A new background spectrum is recorded after each sample has been examined so that effects due to changes in the atmosphere, in temperature or in other environmental conditions are automatically removed. Scanning of the complete spectral range is completed in about 1 minute and the sample change and background acquisition routines are sufficiently fast, that about 50 specimens can be examined in 1 hour. Obviously, the data is logged on the computer and then processed. Typical nir spectra of a beer specimen is shown in Figure 3. It will be noted that only a relatively small pair of ranges are used in the analysis. Figure 3. FT-NIR spectra of beer samples illustrating the ranges that change with alcohol concentration. The near infrared data is then submitted to chemometric analysis using Partial Least squares #. This is done fully automatically; the operator is unaware of the procedures involved. The results are presented in tabular form on the screen and data logged for future use. # Editors Note: The mathematical routine used to analyse the data used is called Partial Least Squares analysis. There is little point in explaining the method and how it is done here because we will be featuring chemometrics in a future edition later this year. It is sufficient to accept that the methods look for trends in changes in the spectra in a series of samples where the changes vary as does a known difference between the samples eg. The alcohol content. If a trend can be established, the trend itself can be used as an analytical probe. Obviously, to establish the trend, suitable standards have to be made, examined and data logged. One catch with the method is that moving outside the range of the standards you have used (extrapolating the results) is very dangerous. Extrapolated results can frequently be meaningless so you must have decent standards and discipline yourself when doing the analysis. Some managers may not wish the tabulated data to be exposed to the system user. Management can therefore define limits within the system and the operative is then only shown a red or green light to define acceptability or failure. Quite obviously sets of precisely analysed samples, which vary in only one respect from one to another, must be prepared and then examined as will be the unknown. Perkin Elmer have therefore acquired a huge range of specimens and examined them, defining in each case the data required to permit users to employ Brewer’s Assistant without any sophisticated calibration by the end user. The name used to describe this procedure is the Scientist Inside. 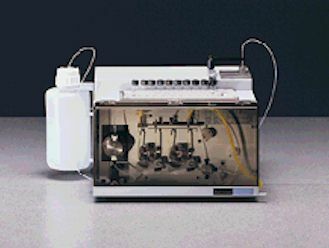 Samples used in the ABV calibration set cover the range zero to 12% alcohol. The software absorbs the spectra from the full set of standards and produces a plot of the variance against the alcohol content. To test how good the calibration is, it then removes one spectrum from one sample at a time, recomputes the plot using the remainder and uses the removed one as an unknown. After doing this for all the standards in turn it then displays the deviation in these calculated quantities against their known alcohol contents and calls this the Standard Error of Prediction in this case expressed as % alcohol content. This is the density of the beer once made and lies within the range -1.8 and 26ºS or 998.2 and 1.026kgl-1. The standard error of prediction is less than 0.2. Several other properties can be determined by FT NIR spectroscopy for example, real and apparent extract, degree of fermentation, the energy value in calories to name just a few. The beer market is rapidly changing – drinkers want special beers of different flavours, colour and alcohol content. They want exotic and reliable tastes and hence the industry is faced with both an increasing complexity of products, combined with more consistent beers. Ever more strict regulations of the industry is also to be considered. The Brewer’s Assistant is aimed to satisfy the demand for a high performance analytical system requiring little of no skill by the operator, yet able to satisfy all regulatory requirements and customer ambitions. About Brewing Technology, Hobsons Publishing plc, 1998.